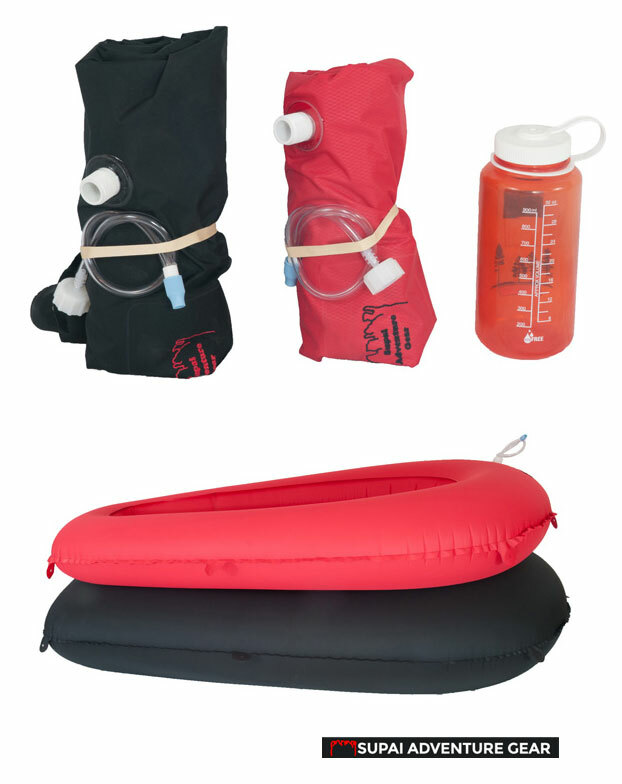 Among other things Supai Adventure Gear (moto: ‘Where every ounce counts‘) makes what have become to be known as ‘crossrafts’, ultralight packrafts suited to gentle flatwater floats, canyoneering or crossing lakes while avoiding any kind of rough handling. In other words it’s like a slackraft pool toy, but at a fraction of the weight and made from fabric, not PVC film. We were a bit unlucky with our Matkat so bear that in mind when reading what follows. We assumed the previous user had given our example a hard time and managed to put no less than two holes and a split in it. That’s two more punctures than I’ve collected in ten years with IKs and five years of packrafting. 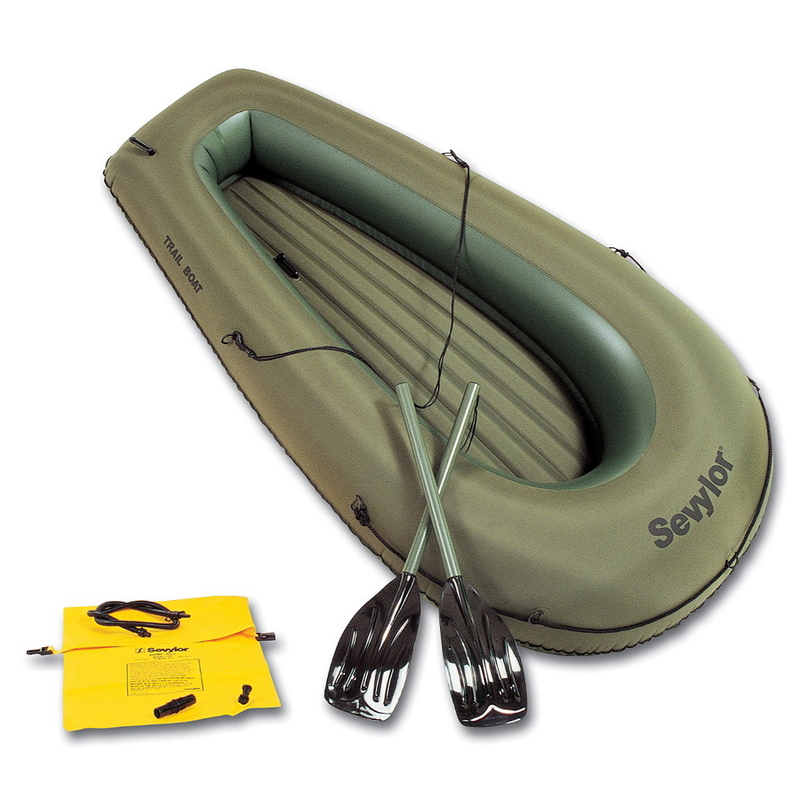 The Packrafting Store has since been informed by Supai that that boat was part of a batch with production flaws. Blowing the boat up out of the box revealed a puncture under the stern (not unexpected in that position) but once that was fixed another leak emerged from a split seam. The seam may well be a manufacturing fault, or the black boat could have been left out in the hot sun for too long (right) – a lesson I’ve learned the hard way with a previous IK and one reason I did this to my current kayak. Had the Matkat been my boat I’d have either sent it back or hot-ironed the split shut (as I’ve successfully done on an old Alpacka seat). 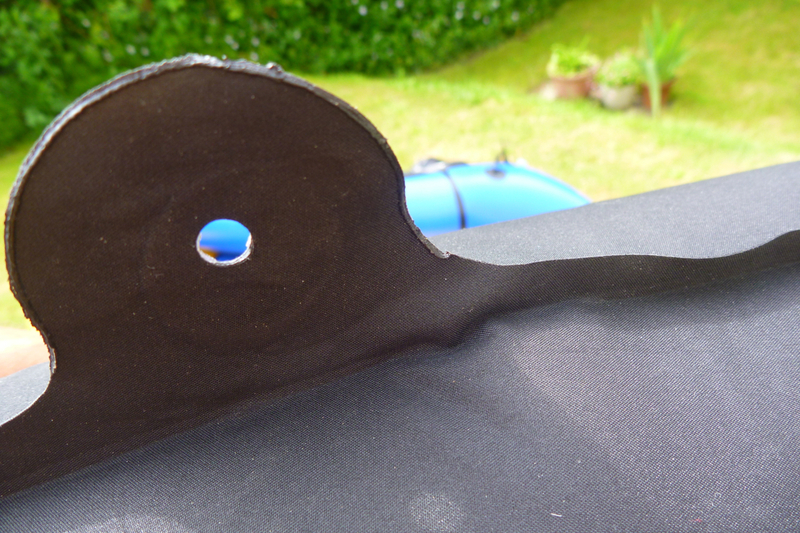 But I didn’t want to risk inadvertently melting a hole in the test raft, so I played it safe with some Bostik 1782. 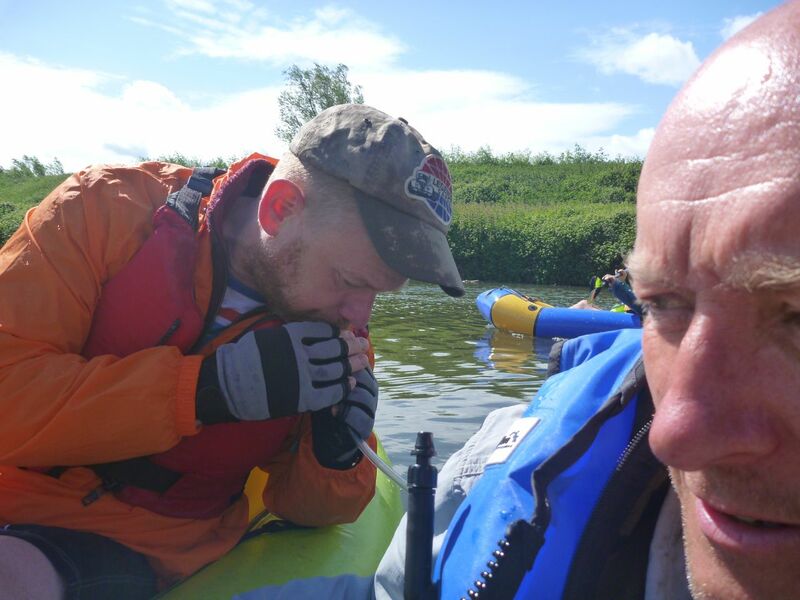 That done, the raft still seemed to lose pressure – or was it just me? I checked the cap and valve and then tried to check the exterior seam for other leaks in the bath, but the Matkat’s bulk makes this awkward to do unless you have a bathroom out of an Imperial Leather advert. So I decided I was being fussy. 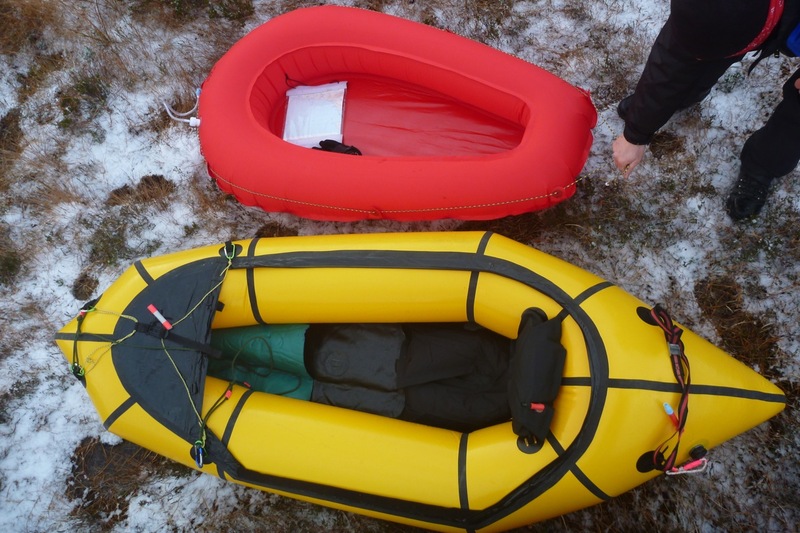 These ultralight crossrafts are always a bit floppy, aren’t they? But now, ten minutes downriver from Tonbridge Town Lock I wasn’t being fussy as the boat got soggier and soggier and my arms strained with the effort of hauling it through the water. Even getting in saw the boat fold up under my weight and take on water; that’s why I’d brought a bailing pump. 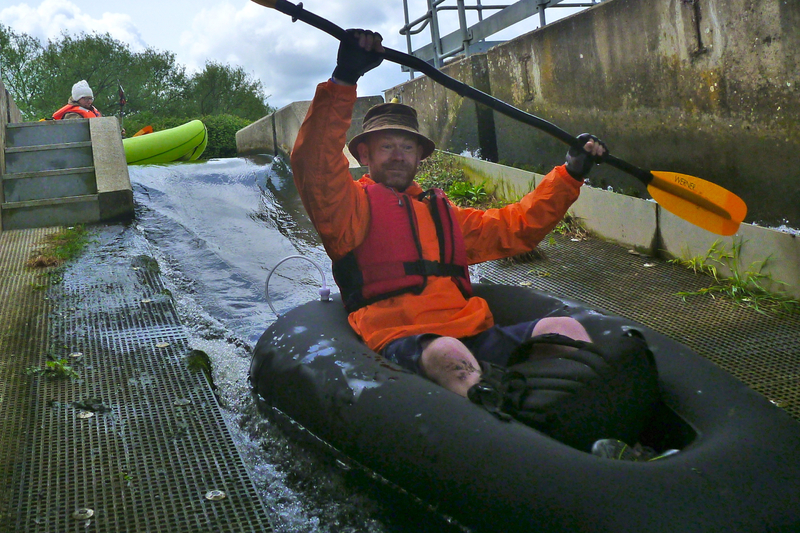 Another ten minutes downstream and I had to call in a top-up (I couldn’t reach the short tube for fear of swamping). As air was slowly lost the boat didn’t actually get lower in the water. Instead you sank lower into it as the raft collapsed in on itself. 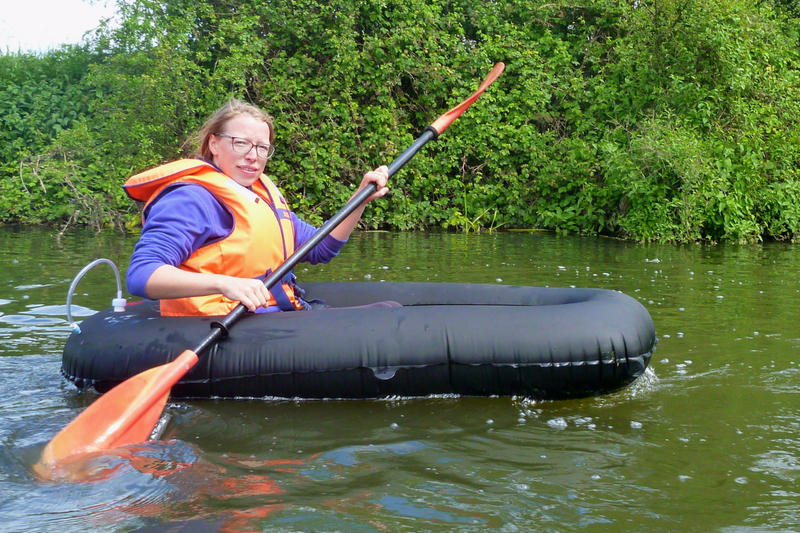 Your backside sags at least six inches below water level making paddling the metre-wide raft even more awkward (you’ll want a long paddle with this one – even with no leaks). Pumped up it was briefly much better – or as good as a Matkat can get, but I needed another top-up before the next chute and a welcome raft change over. Looking at the photos it doesn’t look that bad, does it. But that’s because, like a slackraft, the weight of a person on the water gives the the boat form. Step out (above right) and it became unnervingly limp. It was the same for everyone in what we christened the ‘Bin Bag’. I now know how my mate Jeff felt a couple of years back, paddling his execrable slackraft for nearly a week along far northern Australia’s Fitzroy River (right). 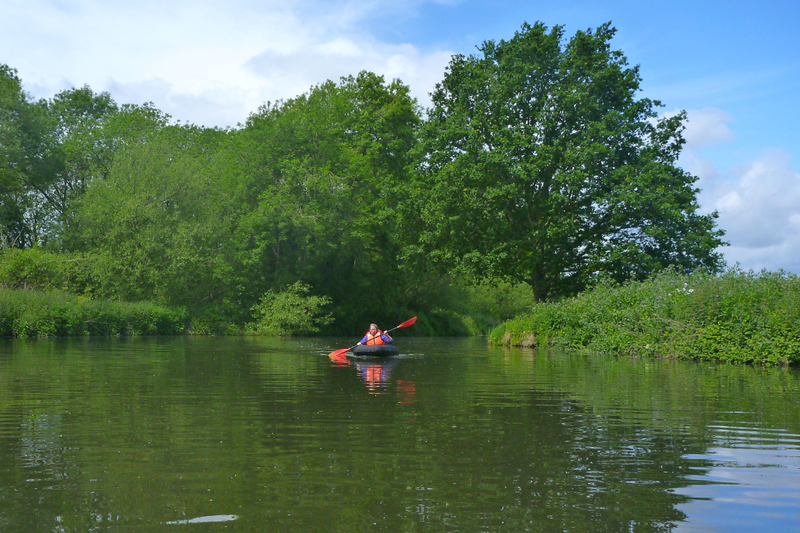 Paddling a wide, soggy, unresponsive boat is as much fun as cycling on flat tyres. 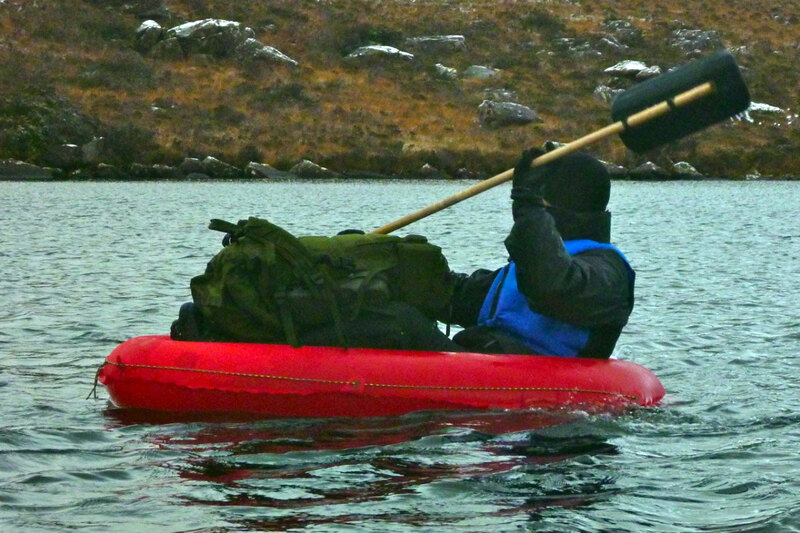 But like a slackraft, even at full pressure I doubt a Matkat’s thin fabric can’t attain rigidity of a conventional packraft. 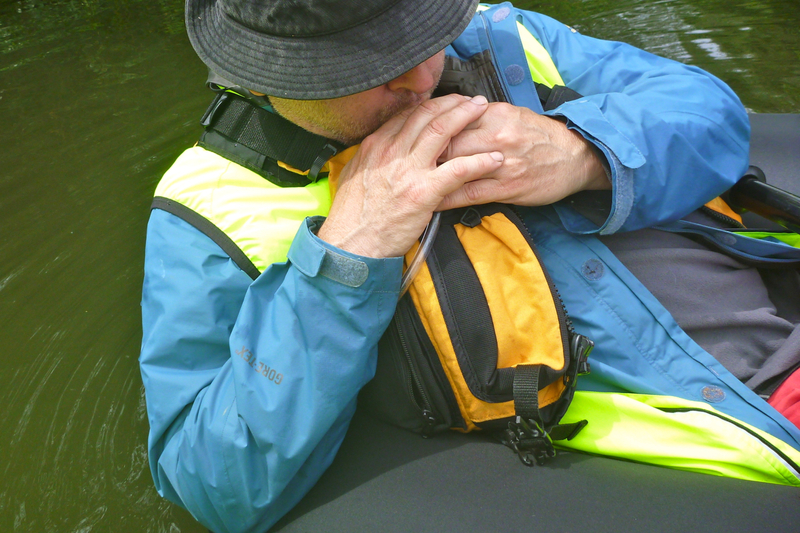 That’s the price you pay for an inexpensive boat that can almost fit inside a large jacket pocket and weighs less than my lightest carbon schmarbon stick. Robin and I briefly tested Supai’s Canyon Flatwater II (left) in late 2013 and, while both attracted to the ultralight crossraft concept, came away unconvinced. The Flatwater floated with 80-kilo Robin in it, but lacked reassuring buoyancy once anything other than the gentlest of paddling was called for. Robin was inches from shipping water over the stern and settling it off into a bobbing cycle could see it swamp (The near-freezing conditions and inappropriate clothing may have influenced our paranoia). The black Matkat is Supai’s answer to the ‘XXL version’ we hoped to see. 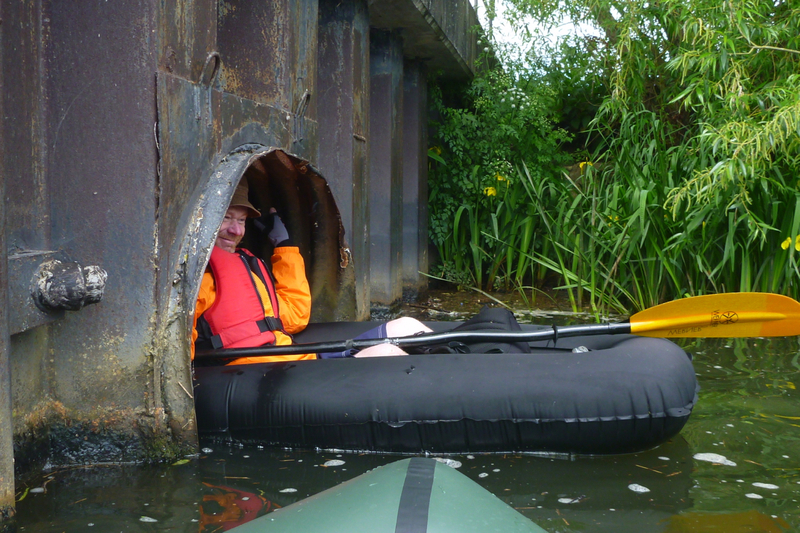 Back on the Medway over lunch I finally tracked down a tiny hole in the top of the raft near the inflation port. 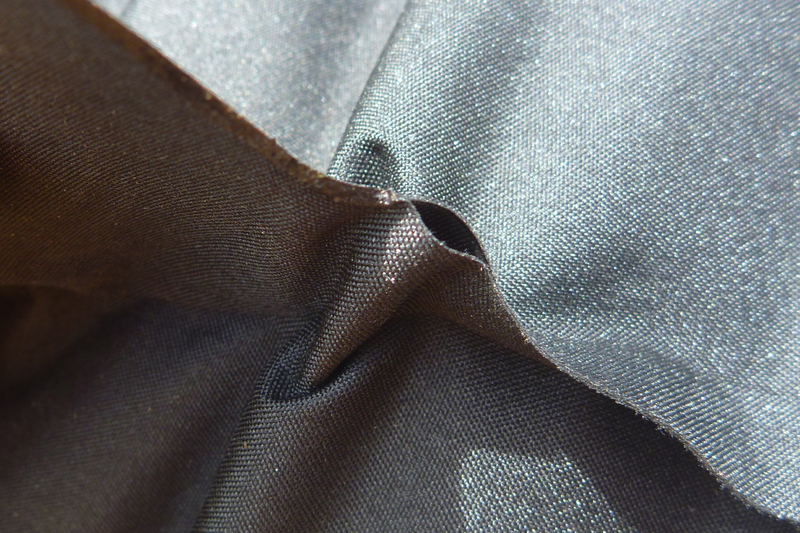 I’d expect damage underneath and maybe another seam to blow, but this was the last place I’d look. So however it happened, it does make you wonder if 75D polyester is pushing things a bit too far for the realities of wilderness adventuring rather than goofing about. Incidentally our Matkat’s fabric didn’t look the same as the red Flatwater II we tested – there’s no embossed diamond pattern. 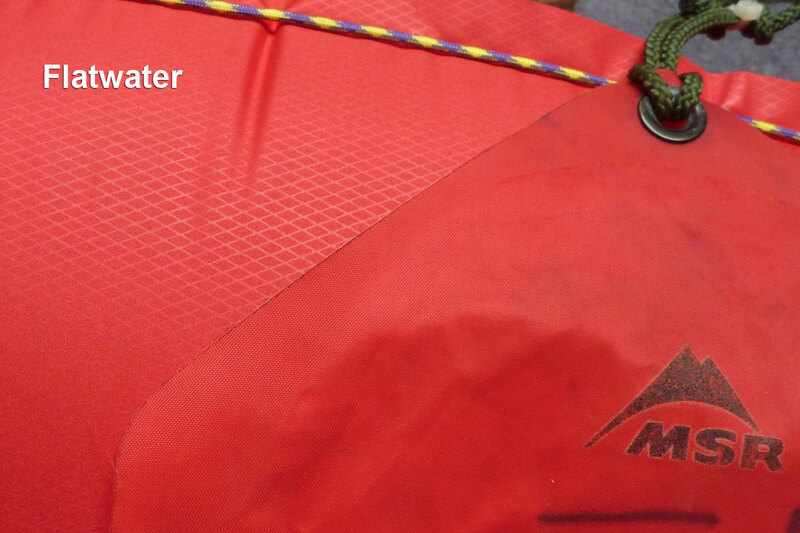 Instead it has the same texture as the MSR water bags I compared the red boat to (right), though I can’t say the Matkat felt any thinner than the red boat. We’d hoped (and even suggested that) Supai make a longer boat with fatter tubes, something more suited to grown men carrying gear. Instead the Matkat is simply a Canyon with 8cm oversized tubes. Now at least a metre wide and 43cm wide where you sit, we weren’t even sure it would fit down the first chute out of Tonbridge. That makes it wider than the Aire BAKraft but you’re sitting up to a foot lower down, well below water level. That’s made worse with no seat. Knowing that I brought an old Alpacka seat base for everyone to use. Bare that in mind in the pictures. Above left is Lois; at 65kg the trim is just about level but she’s sitting some 4-inches higher than normal. Like the Canyon, the Matkat has seven reinforced attachment points punched out from extension tabs along the peripheral hull seam (left). They may all be better used to thread in a perimeter grab line than for attaching heavy gear. Or maybe tie gear off a grab line to avoid a thin line’s direct force on the tab’s hole. 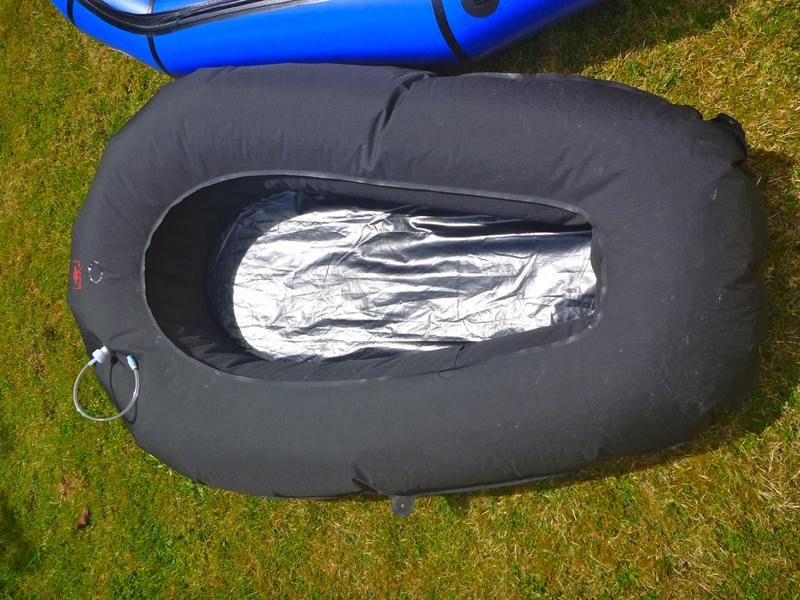 More so than other packrafts, the extremely light Supai’s will take off at the slightest gust – and if that happens on the water following a capsize you could be in trouble. 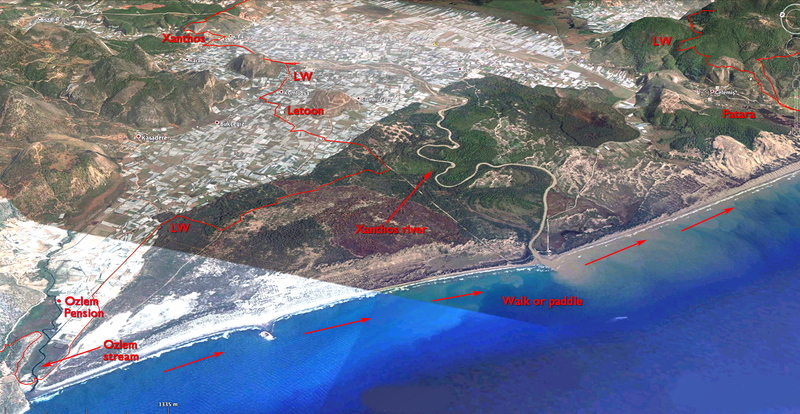 Hence the suggested grab line if not even a tether when paddling in windy conditions. All day the Matkat languished at the back of the pack as each stoically endured their spell in the Bin Bag, periodically asking “how far d’you say to the next chute?” A shower hosed us down and as we neared Yalding tea shop Hannah on her second spell was getting lower and lower in the water until just her head and arms were visible above the sides. It was decided to abandon ship and enact an on-water emergency evacuation. 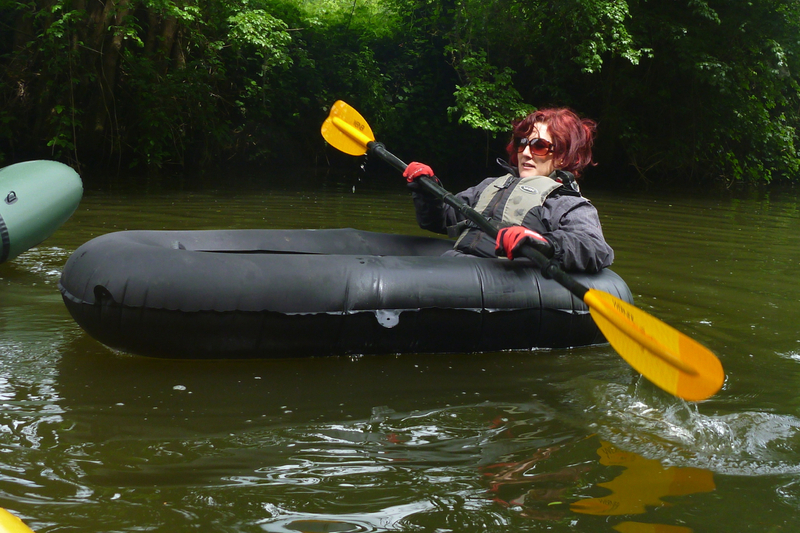 We unclipped the Aire’s bulky backrest, Hannah crawled onto the BAKraft and with Lois they shot off downstream like a skimmed pebble. 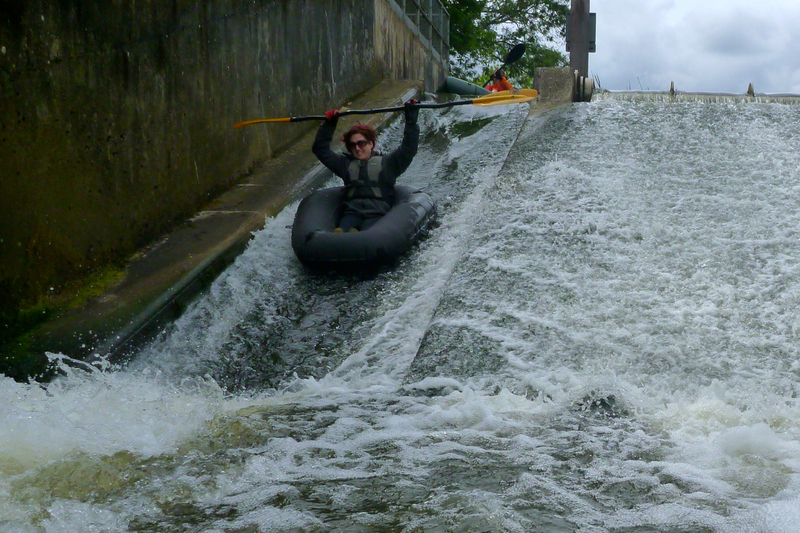 The Matkat was aired down and stuffed into a raft. I said as much when the Matkat’s dimensions were announced a couple of months ago. 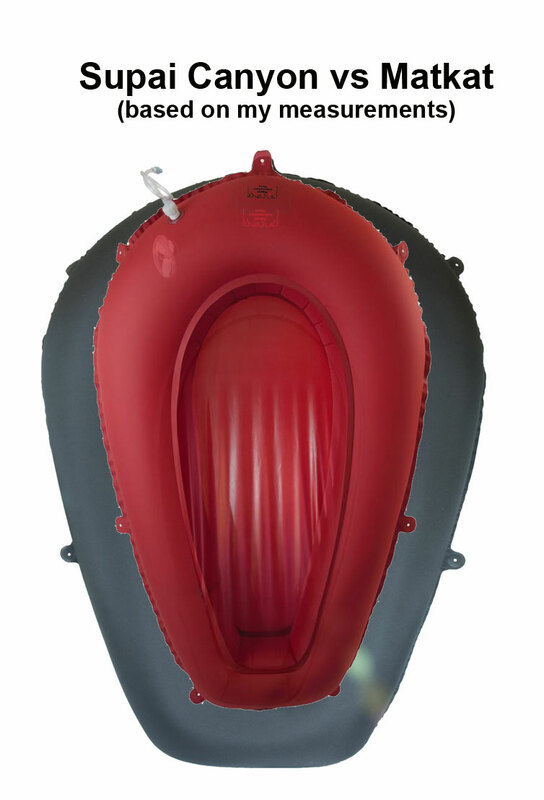 By taking the easy way out and using the same floor pan and internal section, Supai missed a trick by making this a fatter, wider raft (100 x 175cm, but see the intro) rather than a slimmer, longer one. 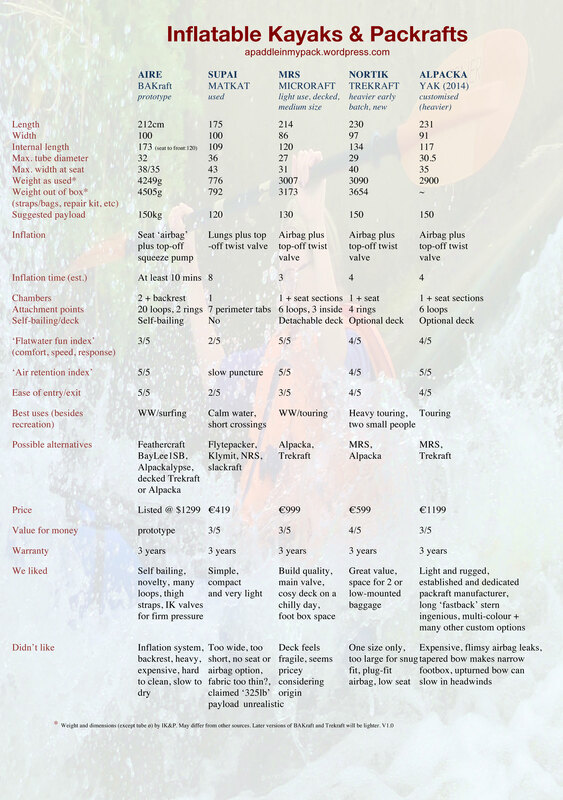 As it is both Supai models could easily lose 5cm of width inside; it’s not like you’re going to be bracing the thing through Grade III whitewater. It reminds me why the Alpacka-style extended stern works so well: it adds buoyancy where it’s needed but without width – and it lengthens the water line for greater speed. There is a place for an inexpensive sub-1000-gram crossraft. I could have used one myself in Turkey the other month where the 3kg weight and bulk of my Yak became a chore over 200kms. But no matter how flat the water – be it Scotland or Alaska or the Lycian shore – alone you want to feel secure mid-river, estuary or lake if a gust comes up, a swell rolls in or an oil tanker’s wake surges towards you. The 792-g Matkat has the added buoyancy the Canyon lacks, but the claimed payload of nearly 150 kilos feels improbable in the real world; the momentum of that weight against any wave will see it plough in. The Matkat is now so wide for it’s length it paddles little better than a tractor inner tube wrapped in string (click one back in that slideshow to see what happens to Supais when used too hard). And with this estimated 30% added volume over the Canyon (right) you could really use an air bag, even if they make it an optional extra. (More on inflation – and a suggested solution – in the intro). A seat can be up to the user: they could to sit on a pack or buy a 150-gAlpacka for $25. 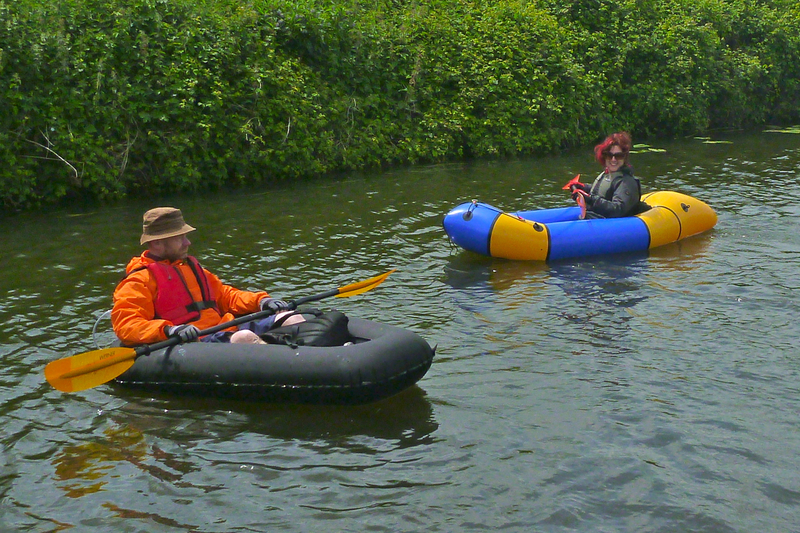 To be fair a full day on a calm river is not a leaking Matkat’s forte, though it’s interesting to note it handled all the chutes, including the steep Sluice Weir, (left) without shipping any more water than the other rafts, including my snazzy Yak. As I mentioned in the Canyon review, what we wanted next was the same boat but just bigger all round (not unlike the long lost Sevylor Trail Boat, above right) because it looks like that would work. Perhaps a 75D crossraft couldn’t contain a longer hull without folding. Whatever the reason, if it ends up weighing 1106 grams, is made of a more rugged fabric and comes with an air bag, then so much the better. For other crossrafts see this. 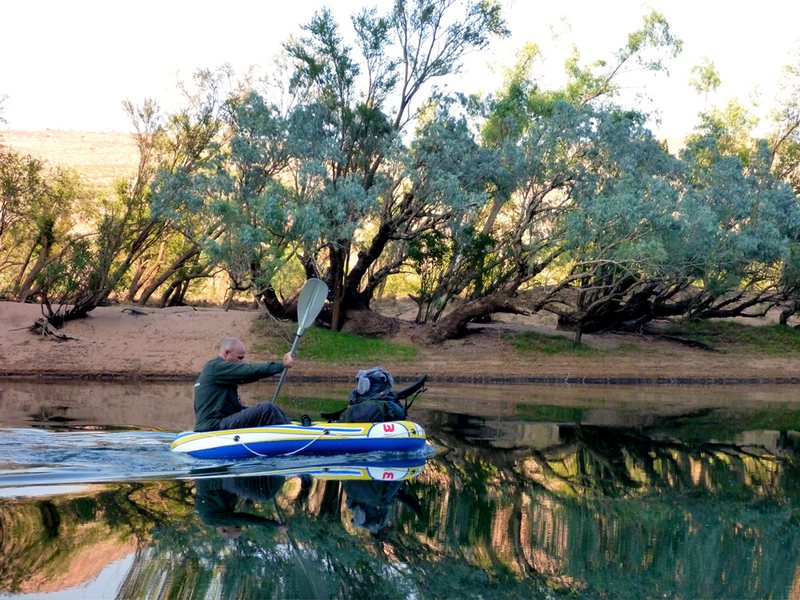 This entry was posted in Gear, Packrafting and tagged crossraft, Giant packraft test, group packraft test, supai adventure gear, Supai Canyon Flatwater II, Supai Matkat. Bookmark the permalink.